A turbine flow meter provides a volumetric measurement of liquid or gas flow through the use of a vaned rotor (turbine) inserted in the fluid flow path. Fluid movement causes the turbine to rotate at an angular velocity proportional to the flow rate. A pickup senses the passage of the rotor vanes, producing a sine wave electrical signal output which is detected by the unit electronics. The frequency of the signal relates directly to the flow rate. 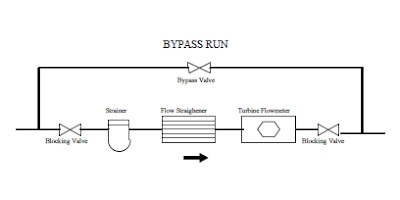 Generally, a turbine flow meter is applied to measure unidirectional flow. 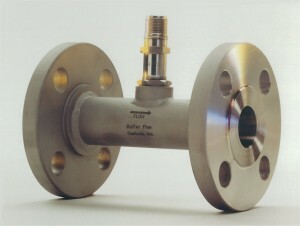 Some turbine flow meters, through the use of two pickups, have the capability to measure flow in both directions. Material of construction: Numerous material options are available for the housing and internal parts. Proper selection considers media characteristics and cost. Bearing selection: The combination of bearing type and material will likely be selected by the device manufacturer, based upon a comprehensive application information set. Pickup selection: Several pickup options may be available, with the manufacturer making a recommendation that best suits the application parameters. Turbine flow meters are precision instruments and will not tolerate debris well. An installation should include a strainer configured to trap debris that may damage the instrument of hinder its operation. For longevity, it is advisable to size the flow meter to avoid extended operation near the upper end of its rotational range. Excessive rotational speeds can accelerate wear on bearings. Lower rotor mass will provide more rapid response to changes in flow, allowing use of the device in applications with flow pulsations. Maintain sufficient downstream pressure to prevent flashing or cavitation. This condition will cause the instrument to produce readings higher than the actual flow rate. Sufficient straight pipe length should be installed at the inlet and outlet of the flow meter to provide flow conditioning necessary for accurate readings. In some cases, a flow staightener may be needed on the upstream side. The output signal from the pickup may need amplification or other signal conditioning. Electrically noisy environments or long cable lengths may require special treatment. Careful consideration of what is necessary for proper operation will pay off with reliable and accurate performance, low maintenance, and a long service life. Share your flow measurement challenges with product application experts, combining your process knowledge with their product application expertise to develop effective solutions. Turbine flow meters for gas service from Hoffer from Flow-Tech, Inc.
Yokogawa, manufacturer of the Rotomass Coriolis Flow Meter utilizing the patented "box-in-box" design, has produced a short video explaining how their design counteracts some of the environmental and process piping conditions that can negatively impact measurement of fluid flow. On Coriolis type flow instruments, conditions that apply stress to the sensor tube assembly can change the resonant frequency of the assembly, impacting the measured reading. 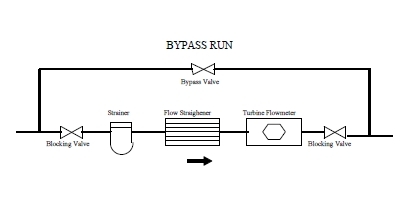 The Yokogawa design employs a means to minimize or eliminate their effect, maintaining accurate measurement of flow in process piping. Share your flow measurement challenges and requirements with product application specialists, combining your process knowledge with their application expertise to develop effective solutions. Pressure indication, on location, real time. That is what a dial pressure gauge provides a process operator. Pressure gauges do not require any type of operating power, making them immune to power failures. The Bourdon tube mechanical operator is generally rugged and reliable. They are, however, subject to wear in the linkage that connects the Bourdon tube to the indicator needle over time. Extremes of vibration will also likely impact the longevity of the linkage, leading to premature failure.